& the only cure is to take a step. One step ahead. That's all it takes. Now you have one ahead in the midst of the behinds & if you keep taking one step -- even if it's a baby step, even if it turns out to be a misstep -- pretty soon you'll be at the head of the pack. The leader of the pack. They'll write a song about you & your motorcycle. Or not. 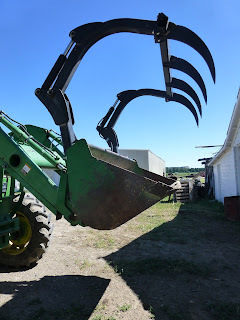 Here is the hungry farm equipment I was trying to feed you last time. Isn't it lovely? I'm going to let this be a baby step, so I will not linger long, except to tell you that I bought a basketball. The prettiest basketball you've ever seen: royal blue & black with silver lettering. Today I took it out on its virgin debut, a little outdoor court right near my house. Shot a few. Made fewer. Grin. Hey, you start where you are. I own a basketball. I took some shots. I'll do it again. 266. Buy a basketball & take it on a date. Or go to a gym that has basketballs you can use. Shoot some hoops. Dribble a little. Feel the leather in your hands, all pebbly & nice.